A sell-out workshop on emotional resilience, organised by leading regional law firm, Howes Percival is expected to raise over £800 for the Milton Keynes Community Foundation, which will be given to local charities and projects dealing with health and emotional wellbeing issues. The interactive workshop, entitled ‘Building Your Emotional Resilience’, was designed for HR professionals and those responsible for wellbeing in the workplace. Julian Hall, an emotional resilience specialist from Calm People, lead the workshop which focussed on helping delegates understand the factors which make up their emotional resilience and providing them with strategies and tactics for changing their relationship with stress. Delegates were charged an entrance fee to attend the sold-out event at the Holiday Inn Express Milton Keynes. Julian Hall donated his time and all proceeds will be passed on to the Milton Keynes Community Foundation to distribute to charities and projects in the local area dealing with mental health issues. “Long working hours, a lack of work-life balance and the demands of working in a high-pressure environment can cause mental health issues or aggravate a pre-existing condition. While open discussion about mental health issues has become easier in the last few years, there’s still a stigma attached, leaving many employees fearful of talking about their problems within the workplace and many managers ill-equipped to deal with such issues. More information about Howes Percival’s Employment and HR services can be found here. 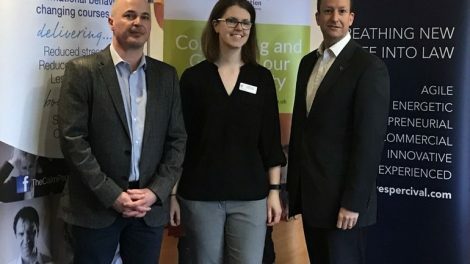 Photo caption (left to right): Julian Hall, Calm People; Natalie Jordan, Milton Keynes Community Foundation; Simon DeMaid, Howes Percival. Enjoy all the benefits being a member brings and register your interest here. Silverstone Technology Cluster Limited is a company registered in England under company No. 10324273.